New York (CNN) – Twin baby boys conjoined at the head were successfully separated early Friday at the Children’s Hospital at Montefiore Medical Center in the Bronx. Jadon and Anias McDonald, 13-month-old twins, had begun their surgery Thursday. The separation procedure lasted more than 16 hours and was followed by several hours more of surgery to reconstruct their skulls and make them whole. Jadon was the first of the boys to be finished. He was wheeled out of the operating room around 7:40 a.m. on a stretcher, his perfectly shaped head wrapped in white gauze. He was taken on an elevator to the pediatric intensive care unit on the 10th floor, where he was reunited with his parents, Nicole and Christian McDonald. “My boy,” Christian said with tears in his eyes. Nicole bent over in tears. More than five hours later, around 1 p.m., surgeons finished operating on Anias, and he was taken to the 10th floor unit — where the family was finally reunited. The surgery was led by Dr. James Goodrich, considered the leading expert on what’s known as craniopagus surgery. It marked the seventh separation surgery performed by Goodrich — and just the 59th craniopagus separation surgery in the world since 1952. 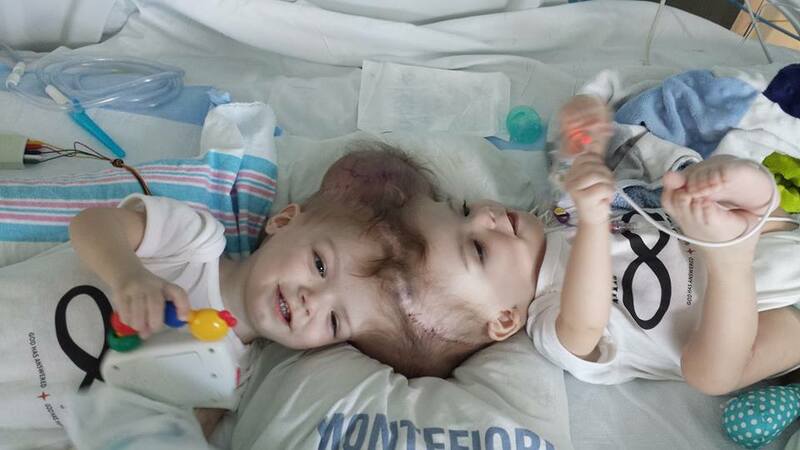 The McDonald twins was his longest craniopagus surgery at about 27 hours. Nicole and Christian had to make an agonizing decision, opting for the procedure even though it carried major risks, including the possibility of death or long-term brain damage for one or both boys. Goodrich informed the family of the separation around 3 a.m.
“Well, we did it,” Goodrich said. The moment capped an end to an agonizing wait for the boys’ parents. The McDonalds and Montefiore hospital invited CNN to document this remarkable and rare journey of Jadon and Anias, allowing CNN exclusive access into the operating room throughout the procedure. Yet before Nicole and Christian learned their boys were now two individuals, Thursday was a day of high emotion and high stakes, of anxious parents and calm medical professionals. It was a day of uncharted territory and amazing, one-of-a-kind surgical activity. And amid it all were two infants — beautiful boys with deep brown eyes and a shared swirl of hair at the top of their foreheads. They came into the world together, and became two individual boys overnight.